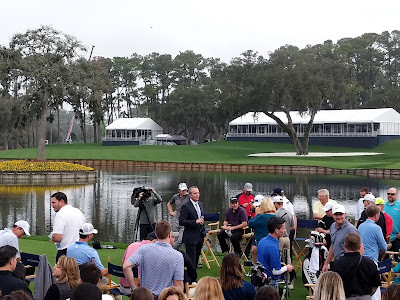 February 12, 2019: With a month to go before the "best field in golf" tees it up at TPC Sawgrass in Ponte Vedra Beach, The PLAYERS Championship hosted a Charity Challenge on the 17th Hole and a media day which included looks at the course, a new fan-experience layout, a new sandwich, and a new trophy. 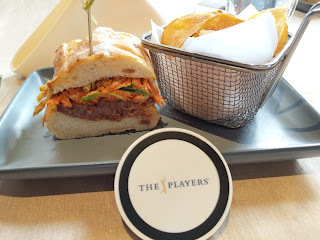 Welcome to The PLAYERS 2019! First of all, mark those calendars, because the 2019 Tournament takes place March 12-17. Yes, that's March. Long-time fans will remember that the tournament was previously held in March until its rescheduling to May in 2007 ("Moving to May"). In 2017, the PGA Tour announced the move back to March in 2019. 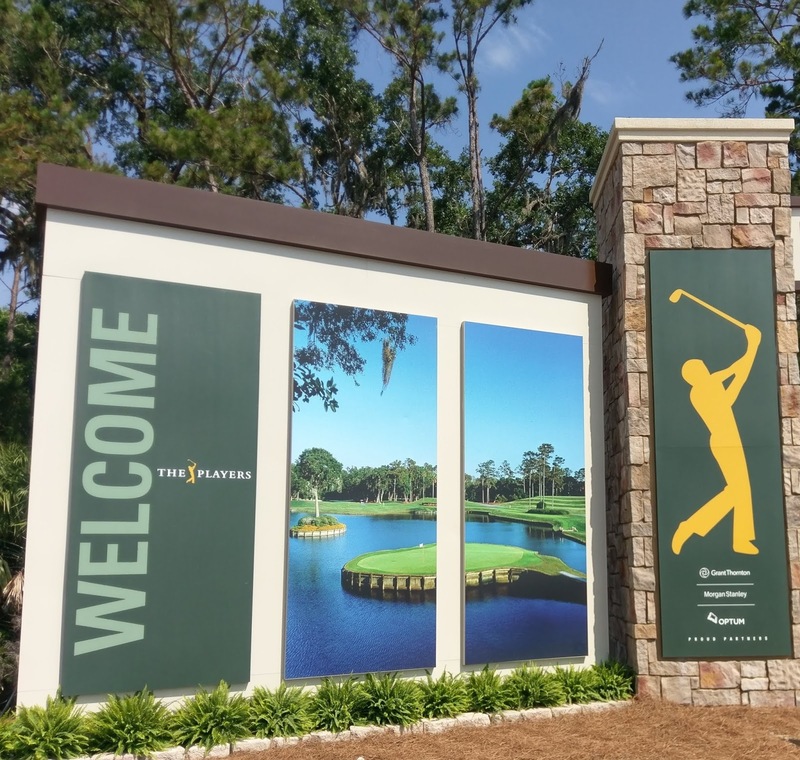 About a month ago, Tournament Executive Director Jared Rice outlined noticeable changes to the tournament grounds during a luncheon with the St. Johns County and Jax Chambers of Commerce. The move to March will allow The PLAYERS to "kick off" the Tour's major championship season and a chance to "own" the sports calendar during the summer months. 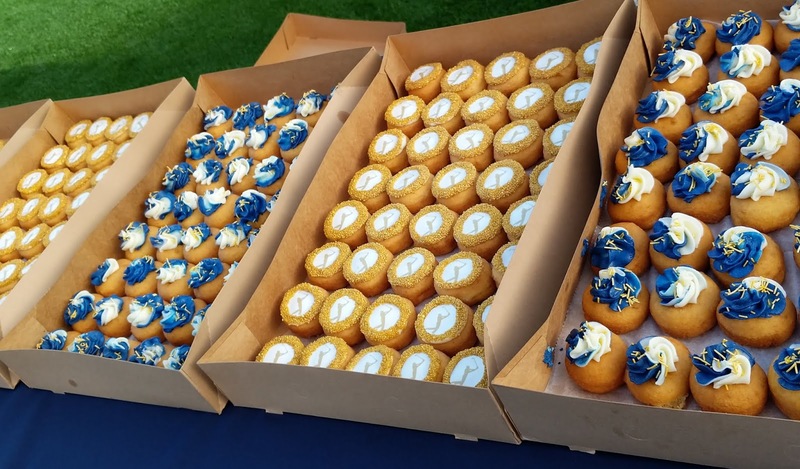 The tournament occurs the week before NCAA March Madness, and while the community had rallied around a Championship Sunday on Mother's Day, many wanted to be home with families. The revised Tour schedule allows its majors to conclude before the fall football season starts. For those watching on TV, the telecast will also feature new modern, energetic theme music recorded in December. With a campaign heralding "Our Gold Standard," the Tour's flagship event will once again "give back to charity in our hometown." Having generated over $100 million for local charities since 1977, and over $50 million in Northeast Florida over the last eight years, "imagine what we can do over the next eight years," Rice exclaimed. With the date change, TPC Sawgrass agronomy staff overseeded the course by planting cooler weather grass on top of warmer weather grass. The result? The course is in spectacular condition, with emerald green, lush grass throughout. Those who have attended the Tournament in the past will immediately notice the new enhancements and changes to the grounds map. The main gate, the Nicklaus Gate, leads fans from the general parking lot to stands behind the 17th Tee. This year brings an entirely redesigned and relocated Stadium Village to the Nicklaus Gate entry area. From the parking lot, fans will traverse over a new 30-foot wide elevated boardwalk over wetlands to a "hub of activity," said Rice, which makes it "easier to be connected to both the front and back nines." It's all about the fan experience, and the redesign provides an "enhanced first impression." 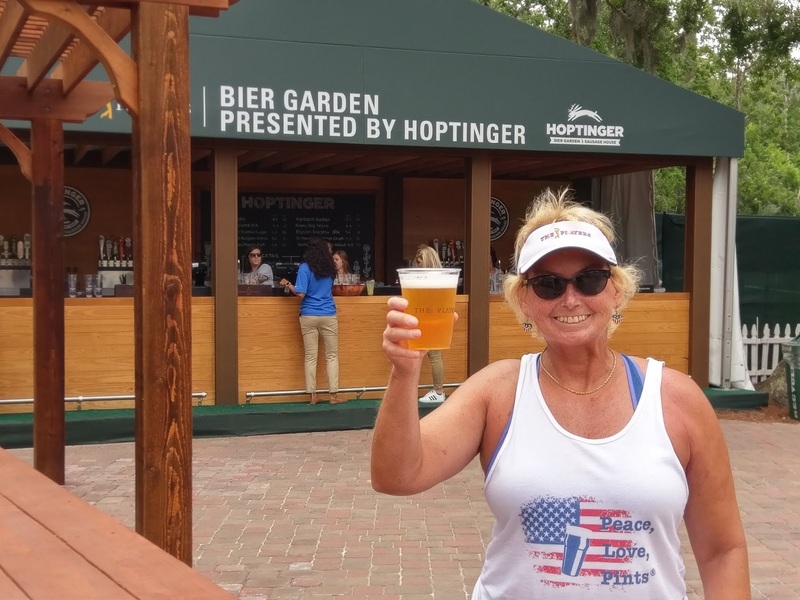 The Bier Garden was a hit last year, and crowds filled the area as the week went on (one of the benefits of practice rounds is more freedom to move around!). Oh, c'mon, you had to see this one coming! Fans will also see the rebranded color scheme: blue and gold. Information signage, boxes and mesh around the stands feature the true blue. 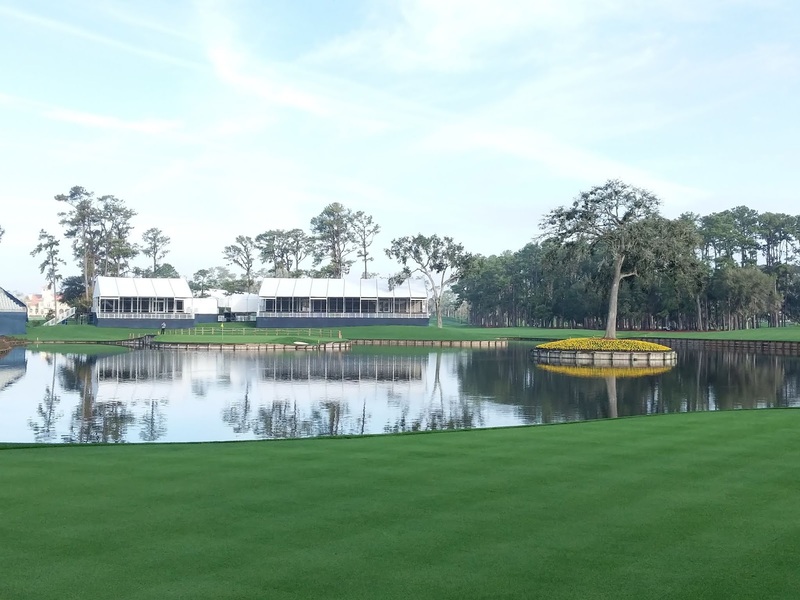 With the move of Stadium Village from the Clubhouse/18th Green area, a new venue takes its place: The Sawgrass Square, which will house a merchandise tent and restaurant vendors, including Mini Bar Donuts. 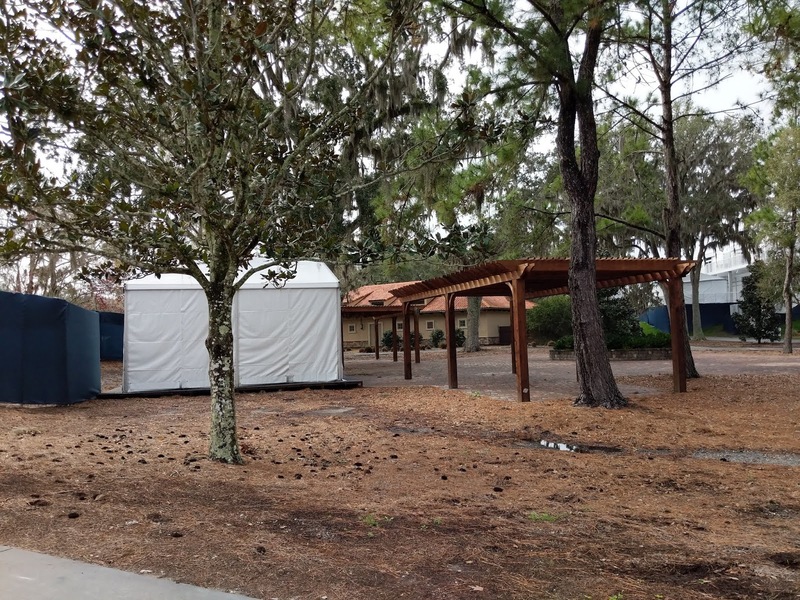 The Palm Valley Village by Publix is located behind the practice area across from the clubhouse. Fans will be able to order the special Players Sub at the tournament and in Publix stores beginning March 1. An all-inclusive experience, the "Captain's Club," will offer an upgraded ticket and indoor/outdoor seating, food and drinks, between the 16th and 18th fairways Thursday-Sunday of tournament week. The Tournament started things off with its annual Charity Challenge closest-to-the-pin invitational event on Monday morning. 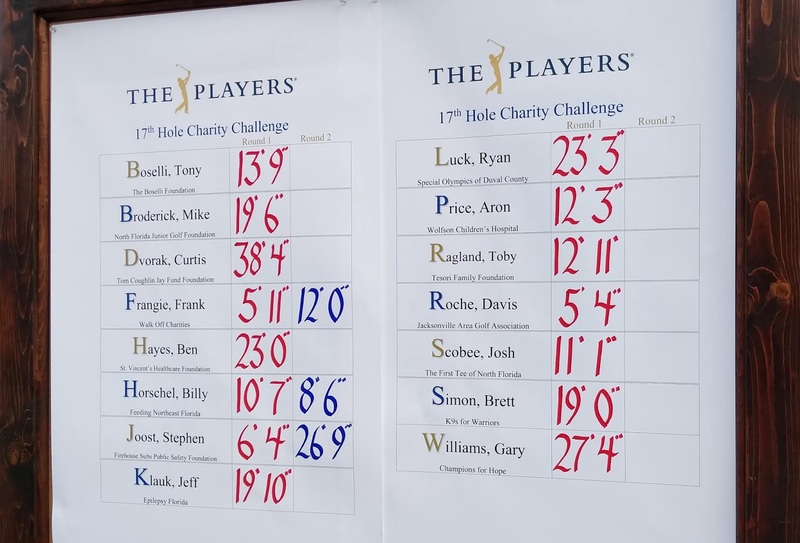 Fourteen local charities designated the shotmaker of their choice to hit two shots from about 125 yards at the famed 17th Hole. 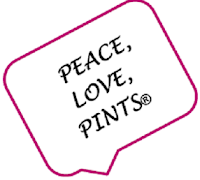 The winner of Round 1 earned $10,000 for the organization, with a winner in Round 2 taking an additional $5,000. 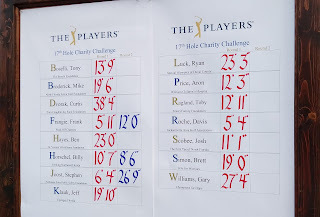 Each golfer hit two shots, followed by defending Players Champion Webb Simpson taking one attempt to get the ball closer for each respective charity. Closest to the hole wins. 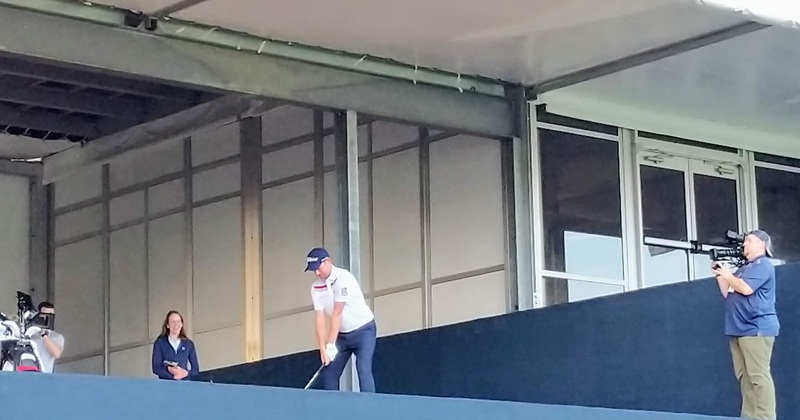 Before the competition began, Simpson had a little fun hitting balls from the Golf Channel booth location in the stands. 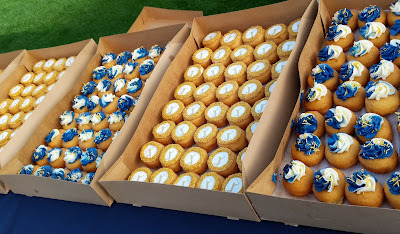 Of course, several donuts found their way into my hands! A few dogs from K-9s for Warriors watched intently, after Webb the player met Webb the dog. First on the tee was Davis Roche, the Jacksonville Area Golf Association (JAGA) Amateur Champion, who hit it on the right front of the green, and Team Roche took the first place prize for JAGA. The field included former Jaguars players Tony Boselli and Josh Scobee, Golf Channel's Gary Williams, Curtis Dvorak of First Coast Living and former Jaxson deVille (also a former winner of this event), and more. 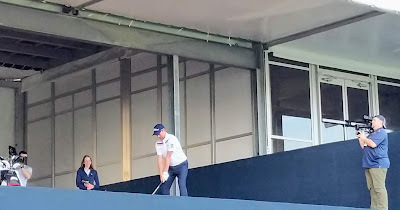 Simpson showed good form, and it seemed that he was trying for that Sunday pin placement to the upper tier. 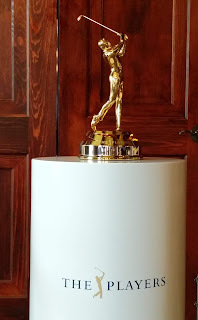 At the earlier Chamber lunch in January, Jared Rice kept the audience in suspense regarding the new Tournament trophy, only saying that the crystal trophy had been retired in favor of a renewed commitment to the "Swinging Golfer" Gold Man logo. On Monday, the new trophy was on display (see top photo) as a Q&A session with Simpson and Rice took place in the Champions Room in the clubhouse. What's that in Simpson's lap? Yes, there's even a new tournament sandwich! The "Simpson Sandy" created by Simpson and TPC Sawgrass Chef is a brisket sandwich slow roasted for over 16 hours then slow-cooked and topped with a carrot slaw and crunchy onion straws on a soft potato roll. Each year, in addition to hoisting the trophy, the defending Champion is given the opportunity to create a new menu item. Look for the "Simpson Sandy" on the menu during tournament week. The "Simpson Sandy" (half) was served with house chips during the session. 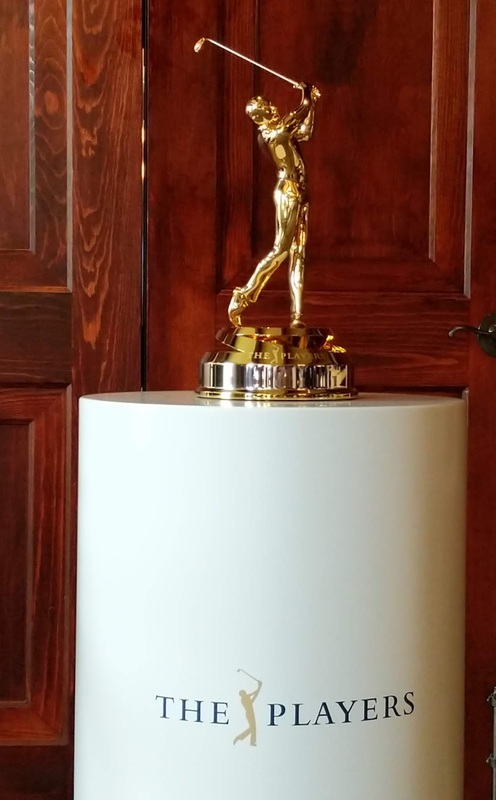 The trophy was produced by Tiffany & Co. from sterling silver dipped in 24K gold. 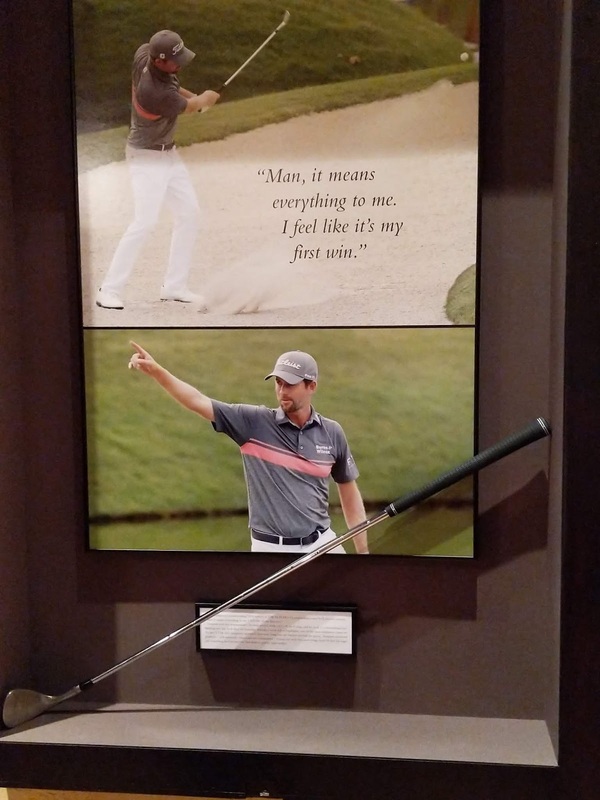 The Swinging Golfer replica is the result of imaging all of the prior tournament champions into a composite. According to Tiffany, "one of the most iconic logos" combines with one of the most iconic holes (17), which is also incorporated into the trophy. As for Simpson, who currently holds the crystal, "it would really be cool to put this side-by-side" at his house, he said. A number of topics were discussed during the Q&A session. 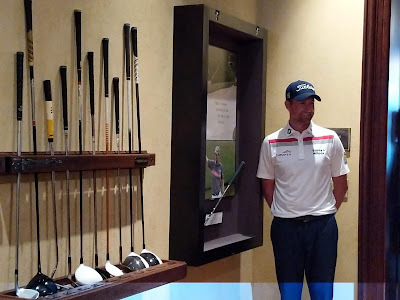 What "sticks out most" from 2018, said Simpson was that he had been in a four-and-half year drought from winning his last tournament. "It had always meant a lot," but he hadn't typically played well here in the past. Only 18 players from the 2018 field have played the tournament when it was held in March previously (according to Rice at the earlier Chamber lunch). He added that statistically, the tournament is the most difficult to win and "favors no style of play." The field is limited to 144 players. Rice stated that ticket sales are outpacing last year's sales by about 10%, and the Tour is seeing "more engagement" from other markets, such as Charlotte, Orlando and Chicago, likely because of the North Florida climate in March. Another tradition at The Players is for the Defending Champion to donate a club from the prior year to the display in the clubhouse. 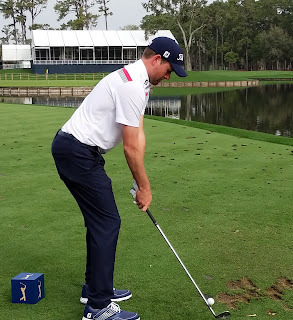 Simpson donated his 54° wedge. Although he hit one in the water during the second round, he also used this club to hit it within two feet on 17 on Sunday. This is a tournament where "you get really excited in the moment, but then have to move on." The course is in "phenomenal" shape (not only did that assessment appear in one of the social media posts from this site on Monday, but Simpson even used that term!). The redesigned and relocated Stadium Village looks to provide an excellent entertainment experience for fans. This tournament is famous for producing more facial expressions from the players, especially on 17 and 18 -- you'll see those flashbacks throughout the broadcast, from the looks after balls sailing into the water on 17, to Adam Scott's disbelief as his shot found the water on 18 in 2004 (which he went on to win). 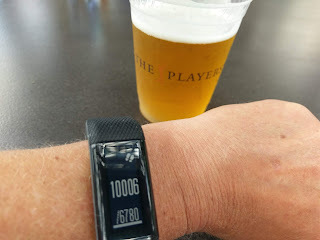 From 2018: this was only the start of a few 20,000+ step days! And, one thing is for certain: if you're into counting steps or miles, you'll accumulate quite a few steps each day during tournament week! Wear comfortable shoes -- the course has more rolling hills and angles than you might expect! TPC Sawgrass is also a great spot for birdwatching and wildlife-watching, too. Great blue herons, great egrets, and ospreys are regular visitors, as well as local songbirds. You never know when you might see a turtle! 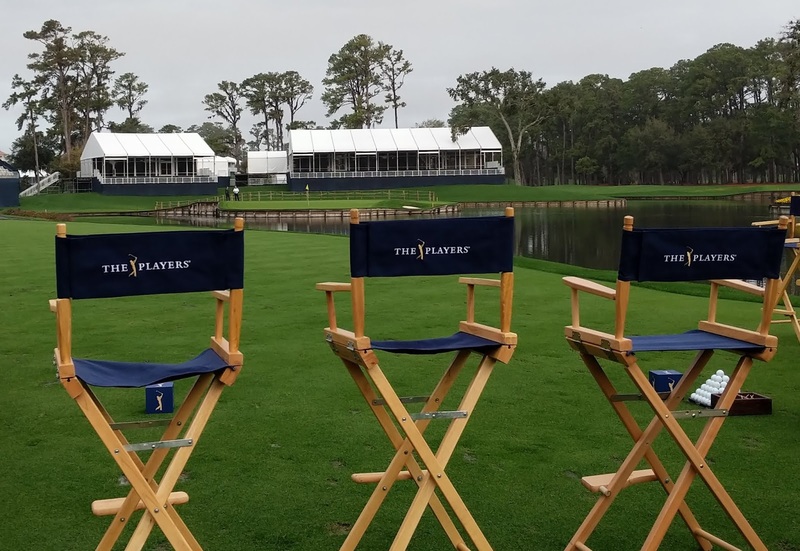 All of the information you need to know about getting around, parking, the "clear plastic bag policy," course maps, dining options, and more can be found on the tournament website, www.theplayers.com. 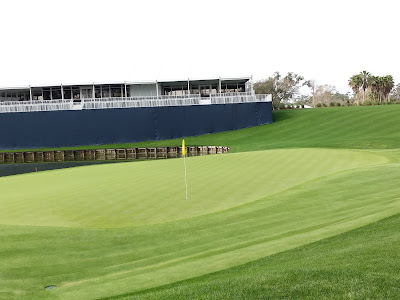 The tournament begins with practice rounds on Tuesday, March 12, which is also Military Appreciation Day and features a concert by country artist Jon Pardi at the 17th Hole. The ceremony begins at 5pm, with the concert following at 5:30pm. Watch for the flyover! The concert is free with a paid ticket for the Tuesday practice round. Note that this year, parking is by pre-paid online parking pass only for tournament rounds Thursday-Sunday. Rideshare, Uber, and carpool are encouraged. Parking for a carpool of four or more persons is free, with the downloaded carpool voucher. Parking in the general lots is free on practice days, Tuesday and Wednesday. Parking passes will not be available at Publix or other outlets this year. Get parking passes here. The Players ends with Championship Sunday on March 17. Yes, that's also St. Patrick's Day, and it should be an "enthusiastic" day to say the least. There may not be a leprechaun with a pot of gold come Sunday evening, but The Players Champion will be holding the gold -- the new trophy, along with a winner's check for over $2 million from the $12.5 million richest purse in golf. 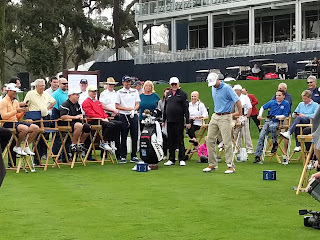 What an amazing day it was at TPC Sawgrass with an awesome event hosted by The Players! I have followed this tournament for a few decades now, and it's in my book as the best week of the year! 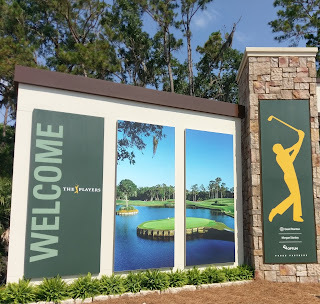 I've played the Stadium course a few times, from vacations while living in the Midwest, thru relocating to North Florida in 2011 -- ask me about "my claim to fame on 17" sometime! I'll be volunteering at the First Tee 17th Challenge Hole a few days, so stop by, say Hi, and try your luck! And, yes, I'll have my step counter and comfy shoes. 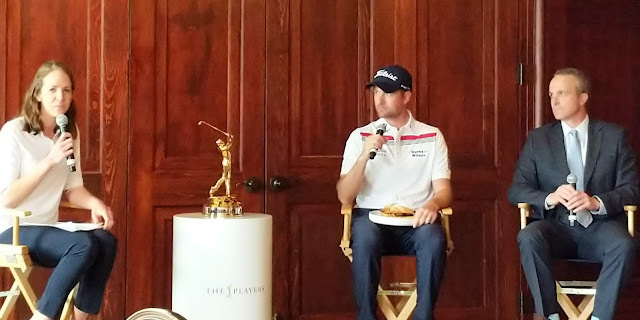 Thanks to the PGA Tour and The Players for the event hospitality, and a special shout-out to Adam Campbell, Volunteer Tournament Chairman for the golf cart tour around the course! WHAT A WEEK IT WAS AT THE PLAYERS! 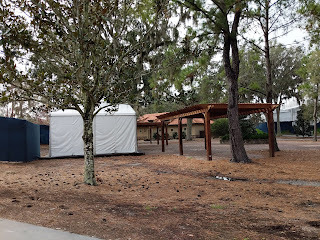 At Round 1, Thursday, 3/14, at The Players! Another awesome day at The Players on Thursday, 3/14, Round 1! A breezy but sunny day saw huge crowds for some popular players and tough conditions that had the guys puzzled on some shots. 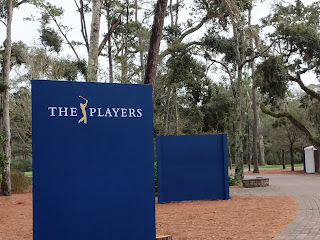 Had an amazing Day 2 at The Players, Wednesday, 3/13. 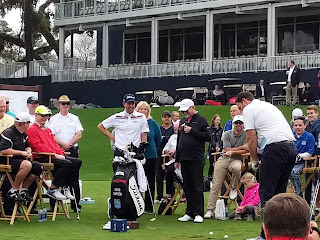 Was also thrilled to be part of the All Star Kids Clinic, hosted by Tesori Family Foundation and Paul Tesori (caddie for Webb Simpson), at the Sawgrass Country Club. Special guest Jordan Spieth put on quite a show. And, the special needs kids were the best! Military Appreciation Day ... wait for it! Cheers to another great year at The Players!